The premise of Free Falling, the work being showcased in this episode of the Sadler’s Wells Wild Card series, immediately raised a number of questions in my head. The show, billed as “a journey of trips, false starts, falls and lifts” looked at face value to be an act of navel-gazing by dancers and dance creatives, a demonstration to the wider world of who they are and what sacrifices they had to make to get to where they are now. In short, a vanity project, or at least an excuse to be avant-garde and appear to screw things up, and have a bit of fun doing it. I could not have been more presumptuous, and more wrong. This enthralling piece was performed very skilfully. Fair enough, some might have found it mindlessly repetitive. Who knew, for instance, that there were so many ways to fall over? But from the opening sequence, with no music at all, just the thud-thud- thud of Stephen Moynihan falling over, over and over again in so many different ways, to its enigmatic climax, the show provided much food for thought. So much so that in the post-show discussion, academic Dr Efrosini Protopapa felt it necessary to apologise to the company for her thoughts getting carried away on occasion, such that she momentarily lost concentration on the show itself. I would have agreed with her, except the performance is deliberately thought-provoking, and therefore I didn’t feel uncomfortable, even with the benefit of hindsight, that I was myself thinking about things that weren’t explicitly being enacted on stage. Here’s an example. There’s a running theme of co-dependency in the performance. As the ‘united we stand (or rather, as far as this production was concerned, dance), divided we fall’ message was solidly coming through, I found myself thinking of my weekday morning routine. Even before I start the working day, it’s abundantly clear I’m not independent. I must rely on the trains running on time, or at least at all, and the computer servers at work functioning as they should. I must even rely on my house not falling to pieces – very recently the front door somehow managed to come off its hinges and I was unable to leave the house until the fault was investigated by a knowledgeable tradesman. What has any of that got to do with this dance performance? Precisely nothing, technically speaking, but emotionally speaking, quite a lot. Life is all about co-operation and connectivity. 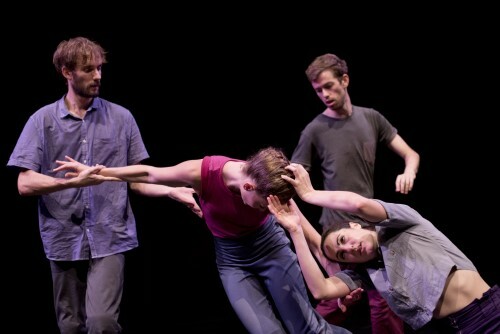 The dancers (the aforementioned Moynihan, plus Sophie Arstall, Fernando Belsara and Verena Schneider) demonstrate through their characters an acquired interdependency between them over a non-specified period of time, and as the show becomes less painful to watch – because there are fewer and fewer falls – there’s a strong sense of learning by experience. The result is an ever-increasingly elegant dance. Even when the action stops completely, the characters are at a standstill to pause and reflect on what both literally and figuratively their next steps should be. The silences are comfortable rather than awkward; quite an extraordinary feat. And why should all dance be accompanied by music? Just having the dance moves and nothing else – there is, for instance, no set to speak of – allows the audience to focus solely on the choreography without even sound to either distract or enhance the performance. It takes some skill and professionalism to pull off something like this, and choreographer Hagit Yakira has it in spades. In the rapid tumbling of a later scene, with all four dancers slithering across the stage, another thought occurred. This production also takes into consideration that there are sometimes external forces much stronger than the collective self. These forces can cause a ‘fall’, and such things are beyond personal control. I could go on at some length about the many other observations that could be drawn out from a show of this nature, but I will take a leaf out of the show and stop, pause and reflect for a moment. And now that moment has passed, I only wish to add that this is a most reflective and philosophical work, and to be commended. I hope this will not be the last time Free Falling is performed on the London stage. 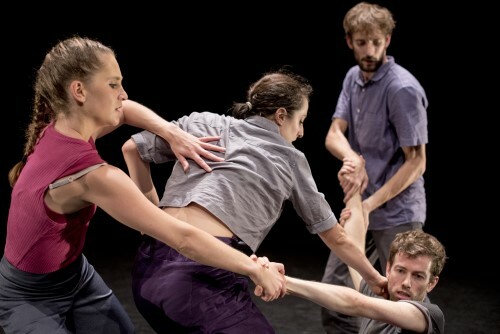 Wild Card invites a new generation of dance artists to curate special evenings and showcase their work. 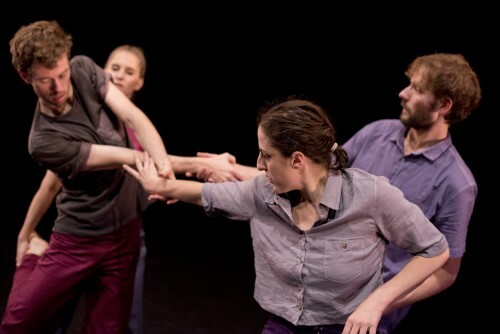 Hagit Yakira is an Israeli choreographer based in London whose work is attracting growing acclaim for her distinctive physical and emotional intensity, emerging from her fascination with stories, psychological experiences and emotions. In this Wild Card, Hagit Yakira invites audiences to experience her take on storytelling for a night of dance and choreography, inspired by her interpretations of femininity and her own real life experiences.